Sable & Rosenfeld Vermouth Tipsy Onions are sure to be your favorite pickled silver skin onions. 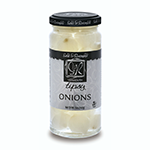 Sable & Rosenfeld Tipsy Onions are bathed in French vermouth and are the perfect Gibson match. Crunchy and sweet. Great as an hors d'oeuvre garnish. INGREDIENTS: onions, water, sugar, acetic acid, salt, sodium benzoate (as preservative), calcium chloride, sodium metabisulfite, potassium sorbate (as perservative), vermouth.